Johnson Products Company (JPC) a formidable force in the personal care industry, has unveiled an aggressive initiative to help an advocacy organization in Chicago combat domestic violence against women. The centerpiece of the “No Excuse! 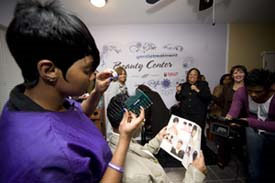 STOP the ABUSE!” initiative is the installation of a unique, first-of-its-kind Gentle Treatment® Beauty Center within Family Rescue's Ridgeland Housing & Day Care facility. Johnson Products Company's launching of the “No Excuse! STOP the ABUSE!” initiative is in recognition of October as Domestic Violence Awareness Month. In addition to the Gentle Treatment Beauty Center, the “No Excuse! STOP the ABUSE!” initiative is comprised of other components including: a four-year $20,000 financial commitment to help fund Family Rescue programs and operations (Johnson Products Company will distribute the funds in annual installments of $5,000); an on-line donation portal and a month-long promotion currently running in select Sally Beauty Supply stores.